Directed by Adam Robitel. Starring Taylor Russell, Logan Miller, Jay Ellis, Tyler Labine, Deborah Ann Woll, Nik Dodani. The Verdict: Escape rooms have exploded in popularity in the last few years. The concept is simple: you’re locked in a room with other strangers / friends and have an hour to figure a way out using clues dotted around the room. They’ve also made headlines for the wrong reasons recently, in which a group of Polish teenagers sadly perished in an escape room fire. 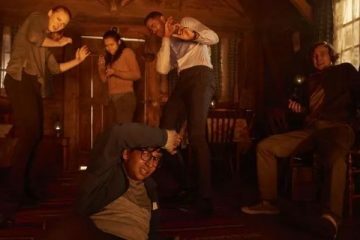 New thriller / horror Escape Room isn’t concerned with health and safety in its deviously-designed rooms – at least for its characters. These rooms are deliberately designed as death traps, something which our characters only come to realise when the flamethrowers come out in the first room. After that, it’s a battle for survival in a ticking-clock environment where nothing is what it seems. 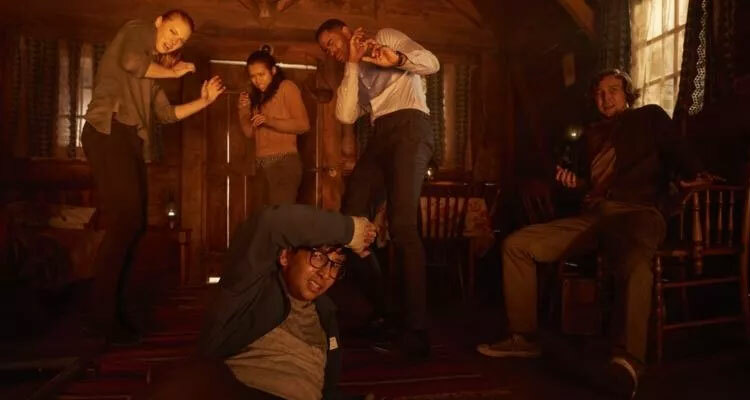 Escape Room is of course derivative of other films – most notably the ingenious Cube. It also borrows liberally from the recently-resuscitated Saw franchise, even including Jigsaw’s trademark phrase. It’s neither as smart as Cube or as gratuitously gory as Saw, but what it does have is a firm sense of itself and then runs with it to thrilling effect. There’s an undeniable sense of glee and anticipation watching these disparate characters crack codes and attempt to escape a grisly death by the skin of their teeth. Who will be next to snuff it? It helps that the game players have troubled backstories. Not much of course, but just enough to suggest that they have the guts to survive what’s ahead of them. The actors help too, pushing beyond the standard cardboard cut-outs of the archetypal horror characters to give them some depth and range. Director Adam Robitel previously made the least impressive entry in the Insidious franchise, The Last Key. With a better script to work with here, he keeps the plot ticking along nicely and amps up the pacing with each fiendish room. The rooms themselves are brilliantly-designed giant puzzle boxes, wildly different and increasingly dangerous from the previous ones. The twists and turns of the plot mechanics, along with some surprising moments, ensure a gripping and nail-biting experience. The lack of gore isn’t a distraction from a ratings issue. If anything, the ratcheted-up tension more than makes up for it. The ending hints at a sequel, which would be welcome on the merits displayed here. Escape Room isn’t a masterpiece by any means. It’s not exactly original, nor is it as smart as it thinks it is. Instead, it’s a nifty, well-made Friday Night thriller with horror overtones that certainly delivers on its intriguing, death-ridden premise. Let’s play a game… This one is quite captivating.